Talkonaut is a mobile chatting and calling software that supports Google talk, MSN, Yahoo messenger and other popular instant messaging accounts. We have already covered the features of Talkonaut and download links. 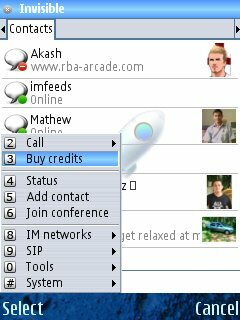 New version, Talkonaut 5 has a very impressive interface with easy to navigate chat list, settings, etc. This is the old interface of Talkonaut 4. Talkonut 5 now supports avatars. However, this actually an unwanted service (at least for some) as it might consume a lot of your GPRS/mobile internet bandwidth. Another major change in Talkonut 5 is the ability to hide our presence. The invisibility feature was introduced in Talkonaut 4 but now fully working on Talkonaut 5. It support new touch devices like Nokia 5800 Express music edition and OS platforms like BlackBerry, Windows phone, iPhone and Android. Talkonut 5 ‘s power arrangement is excellent than earlier versions. Now you can enjoy an improved battery life while being online on Talkonaut. Talkonaut 5 allows to save your chat history for future access. Both chat history and avatars can be turned off from an easy change in settings. Most important feature in Talkonaut, the VOIP over GPRS/3G/WIFI had major updates in voice clarity and quality. Traffic compression technology improved file sharing and bandwidth requirements. 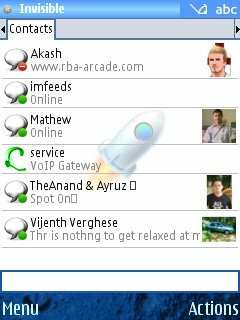 So if you want a full functional easy to use and advertisement free mobile messenger, Talkonaut 5 is for you. Android, iOS (iPhone, iPad, iPod Touch) and BlackBerry users can find latest version of Talkonaut from he respective app stores. Just search for the name in social section.